I am an Associate Professor at RMIT University, in the School of Engineering. My teaching and research are predominantly in the fields of hydrogeology, geochemistry and environmental engineering. My PhD involved using geochemical indicators to improve understanding of the controls on groundwater quality, and the sustainability of groundwater extraction in an area of intensive agriculture in northern China. 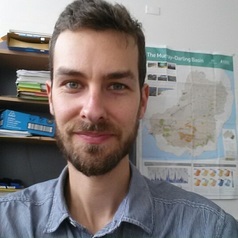 My research focuses on using environmental tracers, modelling and other techniques to understand the effects of various activities and processes on groundwater, such as mining, agriculture, land-use change, climate change and pollution. I have a particular interest in water pollution and other environmental issues in China, and am a fluent speaker of mandarin. I am involved in collaborative research with Melbourne Water, EPA Victoria, Monash, La Trobe and Federation Universities, ANSTO and the Chinese Academy of Sciences.